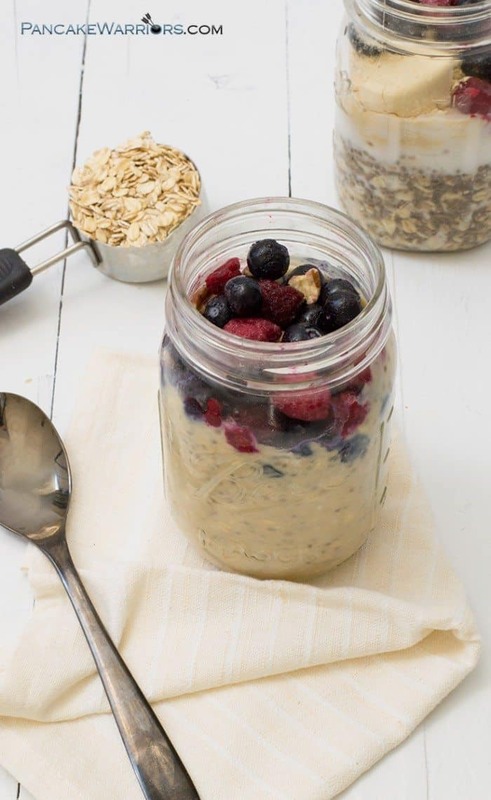 If you find yourself always rushing out the door in the morning, you have to try simple mixed berry overnight oats! These oats are gluten free, packed with protein, full of fiber, and literally waiting for you in the fridge in the morning. When I first started my journey on eating healthier, breakfast was the first meal I conquered. I felt amazing the days I chose something healthy, and that mentality would continue with me for the rest of the day. I noticed I was ordering more salads, avoiding the vending machine and actually felt full after my meals during the day. This was a big change for me since I historically didn’t eat breakfast at all, I relied on large mocha lattes for my fuel! Maybe your go-to breakfast is something you can pick up at the coffee shop or that you can unwrap and eat in your car like a trail mix or granola bar. Unfortunately, none of these options are really all that healthy. Most convenience foods spike our blood sugar, yup even those trail mix bars! This spike in blood sugar so early in the day sends your body into fat storage mode early in the day! This is not what you want if you are trying to lose weight or maintain weight loss. This is one of the big lessons my nutrition clients learn early on when working with me! How do overnight oats help you accomplish these goals? Well they take the “I don’t have time to make a healthy breakfast” excuse off the table! The oats are waiting for you in the fridge, easy to grab on your way out the door and customizable to whatever your heart desires! The best part, you can make 2 or 3 days worth of oats at once and let them sit in the fridge, I don’t think you can get much easier! When I add overnight oats to the meal plans for my clients, they always send me notes thanking me for the simple breakfast idea! If you are interested in getting healthy, simple to follow meal plans delivered to your inbox sign up for a free week! This simple mixed berry version of overnight oats is a combination of gluten free rolled oats, chia seeds, water, milk and protein powder. I topped the oats with frozen raspberries and blueberries, so easy! And all I had to do was measure and stir! I use a mason jar to tote my oats to work in, but you can use whatever you have that has a tight seal (tupperware, pyrex). Let’s talk about some of these ingredients, in case they are new to you! Rolled oats (gluten free) – oats are a great source of soluble fiber. Why is this important? Well they don’t spike your blood sugar since they digest slower, and are full of soluble fiber which can help you feel full longer! Chia seeds – if there was one ingredient I would have every one of my nutrition clients stock up on it would be chia seeds. These little babies are packed with fiber and expand to absorb up to 5 times their size in water, which means they fill you up on less calories. Chia seeds are full of Omega-3 fatty acids as well, which can help reduce the inflammation in your body, helping you feel better everyday! 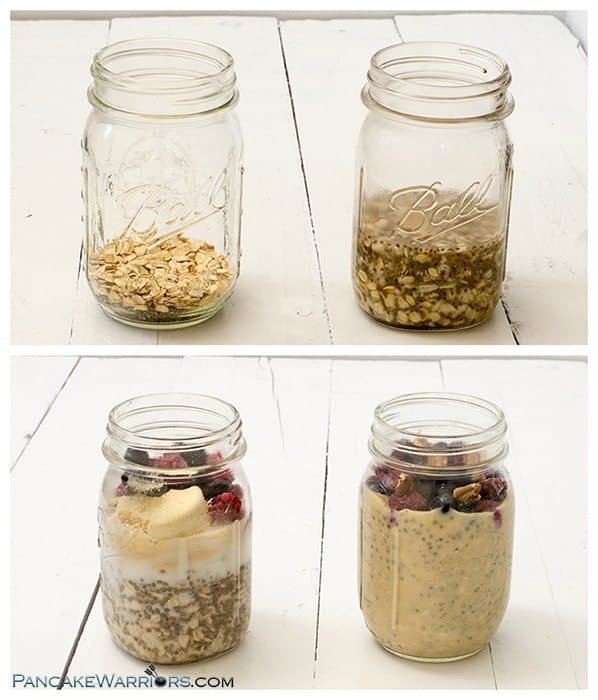 Chia seeds are great in overnight oats, chia pudding, green smoothies, and in baking to replace eggs! You have to check out these quinoa coconut banana muffins if you are looking for a recipe that uses chia seeds to replace eggs! Protein powder – you can use whatever protein powder you have on hand. You may need to add more or less milk depending on the brand and type of protein you use. I use a vegan protein from Try About Time, I also love Sun Warrior, Vega and MRM Veggie Elite. You could also use a whey protein here as well. Whey tends to upset my stomach so I don’t eat much of it. I do have a tip though, look at your protein powder, the sugars should be low. I try to keep sugars to 1 or 2 grams per scoop! Frozen berries – I buy organic frozen berries. I love using frozen berries because I don’t have to rush to use them before they spoil and buying frozen organic is usually much cheaper than buying them fresh in the store. When I see them on sale, I stock up! Remember any fruit that you eat the skin should be organic to avoid eating a ton of pesticides! You may be wondering if you can make overnight oats without protein powder. Of course! You could use Greek yogurt and stevia, regular yogurt and sprinkle with hemp hearts or mixed nuts. This way you are still getting some quality protein with your breakfast. Protein is essential to feeling full and satisfied! 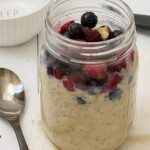 So tell me have you ever tried overnight oats? If you are ready to dive head first into overnight oats, try these cinnamon raisin overnight oats! 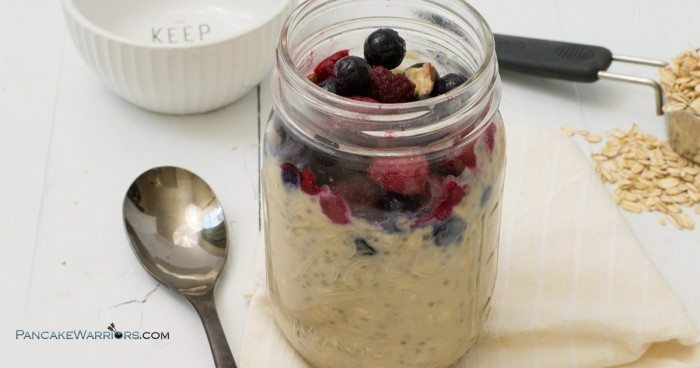 Simple mixed berry overnight oats are an easy way to have a healthy breakfast on the go. Breakfast will be waiting for you in the fridge! Gluten free, vegan, low fat, high protein and high in fiber, the perfect way to start the day! 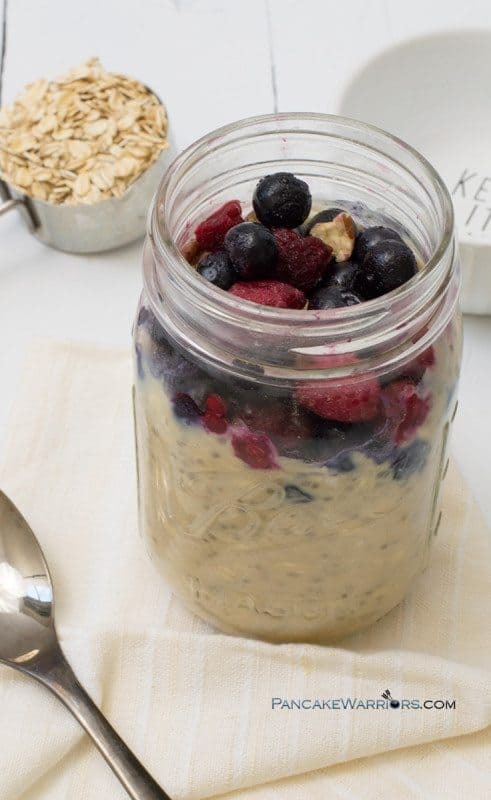 Add the rolled oats and chia seeds to a mason jar (or any container with a tight fitting lid). Pour the hot water over the oats and chia and stir well. Add the unsweetened coconut (or milk of choice), protein powder and frozen mixed berries. Stir and place in the fridge. Tip! You may need more or less milk depending on the type of protein powder you use. If you need more, add it one tablespoon at a time until you get the texture you love. Next time you make this add that to the recipe. If it is too runny, add 1 tbs. protein powder and stir. Going forward only add 1/3 cup milk and see how that goes! Hi there, I’m Samantha Rowland, of PancakeWarriors. I have a healthy living blog that focuses on healthy recipes, nutrition tips and fun quick workouts that will get you excited about exercise. My mission is to help people become the best version of themselves by coaching them through nutrition coaching and personal training. I hope to teach everyone that eating healthy doesn’t have to mean boring or bland!